A yoga skirt is designed to have a stretchy waistband that can be folded down. This project works great for recycling t-shirts. 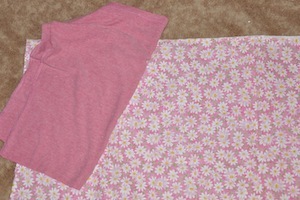 For this tutorial you will need a stretchy t-shirt and 1 yard of fabric. Cut your t-shirt one inch below armholes. Throw away top of t-shirt or save for other sewing projects. 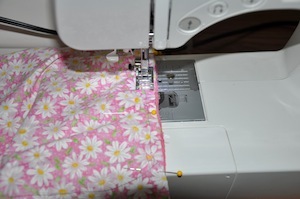 Fold your 1 yard fabric in half and sew side edge together. One side will be the fold and will not need to be sewn. Sew a gather stitch 1/2 inch from edge of top of your sewn skirt. Check your manual for the setting on the gathering stitch. It is a stitch with a very loose stitching that can be pulled together to gather your material. Pull your thread carefully to gather the skirt. Pin your t-shirt with the raw cut edge to the skirt top. Make sure the hemmed t-shirt edge is not the one being sewn. The hemmed edge (which is the bottom of the t-shirt) is all ready to go and will save you an extra step. 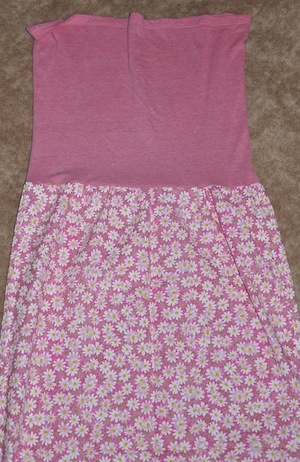 Once the t-shirt is pinned evenly to the gathered skirt top, sew two pieces of fabric together pulling out pins as you go. You can pull out the gathered stitch when finished. Since it won't be needed after you sew the two pieces together. Try skirt on a determine the length you'd like the skirt to be. If you'd like it to be shorter then it is now, add 1 inch to the length you desire and trim. 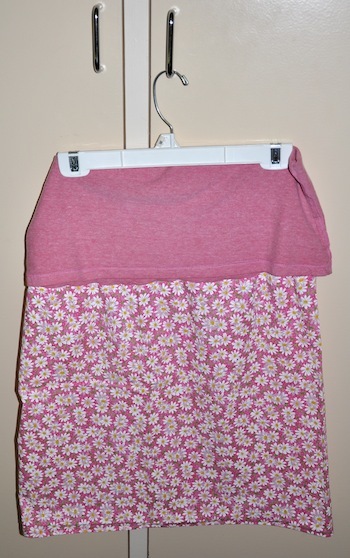 Finish your skirt by hemming the bottom. Hemming is done by folding the bottom edge up 1/2 inch and then 1/2 inch again. Pin in place and sew along edges pulling out pins as you go. That's is it! 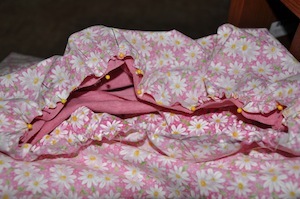 A finished skirt with a stretchy yoga waistband.